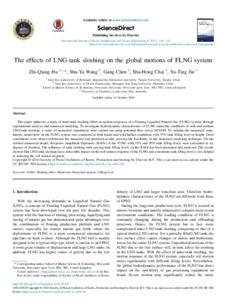 This paper addresses a study of inner-tank sloshing effect on motion responses of a Floating Liquefied Natural Gas (FLNG) system, through experimental analysis and numerical modeling. To investigate hydrodynamic characteristics of FLNG under the conditions of with and without LNG-tank sloshing, a series of numerical simulations were carried out using potential flow solver SESAM. To validate the numerical simulations, model tests on the FLNG system was conducted in both liquid and solid ballast conditions with 75% tank filling level in height. Good correlations were observed between the measured and predicted results, proving the feasibility of the numerical modeling technique. On the verified numerical model, Response Amplitude Operators (RAOs) of the FLNG with 25% and 50% tank filling levels were calculated in six degrees of freedom. The influence of tank sloshing with varying tank filling levels on the RAOs has been presented and analyzed. The results showed that LNG-tank sloshing has a noticeable impact on the roll motion response of the FLNG and a moderate tank filling level is less helpful in reducing the roll motion response.